What happens if you accidentally find yourself in the middle of a mob of angry, chanting Israeli settlers? He took the video above of a Palestinian man running from angry settlers who were chanting “Am Yisrael Chai” (“the Jewish people lives”) and throwing stones at him. Each year, Israel celebrates what it calls the “unification” of Jerusalem – when Israeli forces conquered the eastern half of the city in 1967 and began subjugating its population to military rule and colonial settlement. Zionist militias had already conquered and ethnically cleansed western Jerusalem in 1948. Israel’s purported annexation of the occupied city is “null and void” under international law. Israel considers Jerusalem Day a national holiday: several events are organized during the day culminating with the so-called “dance of the flags,” a parade of thousands of chanting Israelis marching from the west of the city, entering the Old City through the Damascus Gate, across the heart of the Arab quarter and ending at the Western Wall. It habitually involves violent provocations by the settlers who are protected by occupation forces, vandalism of Palestinian property and racist anti-Palestinian chants. Meanwhile, as Israelis dance, Palestinians in occupied Jerusalem have little to celebrate. The human rights group B’Tselem reported this week that up to 80,000 Palestinians have been without regular supplies of running water since March. Zalameh, who has witnessed the parade for several years, notes that from early in the morning buses arrive in Jerusalem carrying Israelis from across the country, including settlements in the occupied West Bank. Only two years ago, Zalameh says, the route of the parade was changed to march through the Old City and the Arab quarter, another measure he sees as part of the wider escalation against Palestinians in Jerusalem. Some compare Jerusalem Day to the worst days of the triumphalist marches held by Protestant loyalists through predominantly Catholic nationalist areas of Belfast that were for years major provocations and flashpoints for violence in Ireland. Jerusalem Day is just like the 12th of July in Belfast, in the worst times: fanatical flag-waving triumphalists lording it over the city. 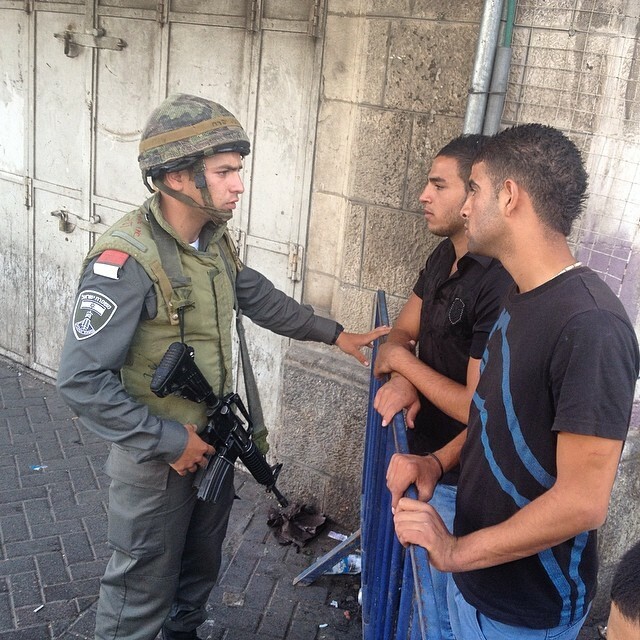 This week, fearing that Israel would use the marches to “escalate threats against Al-Aqsa Mosque, the shabab [young men] had barricaded inside the mosque the night before, anticipating the daily armed incursions of Jewish zealots into the compound,” Zalameh says. Having been minutes earlier in Salah al-Din Street, where heavily armed Israeli soldiers were attacking a protest by Palestinian youth opposing the occupation, I decided to head towards Damascus Gate to witness the parade passing. As expected, the roads were fully blockaded and it was impossible for me to reach the parade. I then decided to take a less direct route only to be stewarded into the parade, seemingly being confused for an Israeli. I went along not knowing exactly what to do. Being the only non-Jew in the middle of what I can only describe as a Jewish supremacist hate-fest made me realize firsthand just how far to the right Israeli society is. The people around me were not a fringe in Israeli society – they were Israeli society, representing all walks of life, from the very young, to the older generation, from the ultra-Orthodox, to nationalist religious and seculars, intoxicated with the nationalist zeal which is typically reflected in Israeli daily life and culture, in the Knesset and routine pronouncements by elected Israeli leaders. I saw a society which is drunk with power and capable of inflicting the worst against “the other” – the Palestinians – should that need arise. While inside the parade, I kept thinking what could happen to me if they realized that I was not “one of them,” such was the mood. Moments later I realized that that they were playing what it seemed to me the “spot the Arab” game – if one Arab was seen, a call was made to the crowd and the mobs moved to charge against the person, with no reaction whatsoever from the Israeli forces. 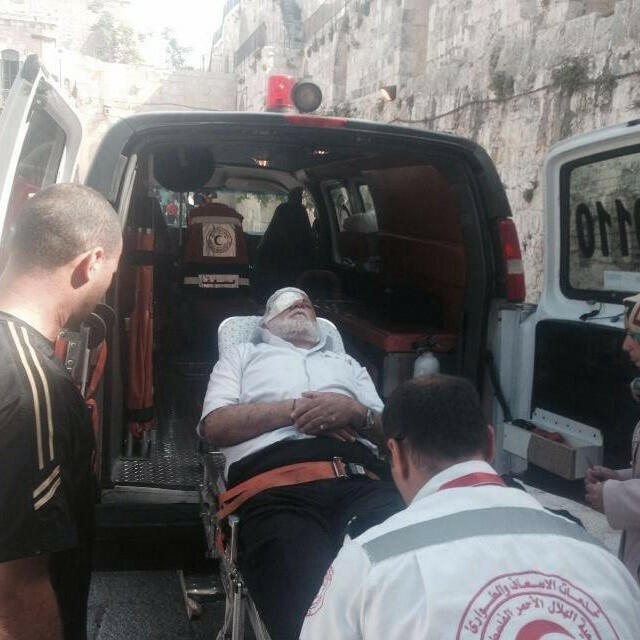 This is what happened on two occasions where passing Palestinians were charged against and attacked. I documented and posted on my instagram one such instance [the video at the top of the post], filmed from the perspective of the attackers as I was inside the parade itself. As you can see from the video the crowd move mercilessly against the terrified man who managed to run away. As I was leaving the Old City at 10pm, the Israeli army was conducting house-to-house searches and arrests in the Bab Hotta neighborhood, while lobbing sound bombs at resisting residents. In the background were the deafening sound of the “celebrations” at the Western Wall. Such is Jerusalem, a city of occupation, colonialism and apartheid. 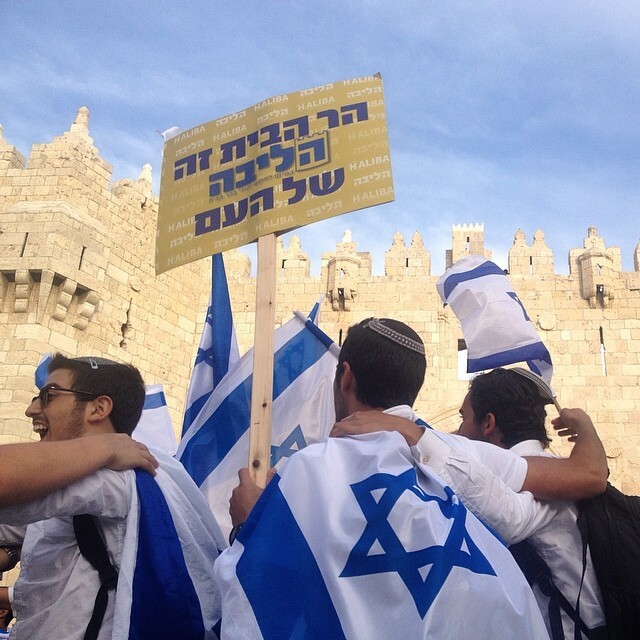 In this image by Zalameh, Israelis carry a sign reading “The Temple is the heart of the nation.” Many Jewish extremists want to destroy the Al-Aqsa Mosque and build a Jewish “Third Temple” in its place. There are more traces of the hate and violence of yesterday’s “Jerusalem Day” on social media. The sickening combination of ethnic triumphalism and colonial violence visited with impunity on the elderly Palestinian in the video, attacked by a zionist mob in jerusalem, tears aside the mendacious narrative of exceptionalism ( " Israel the only democracy in the middle east" etc ) carefully fostered by zionists and uncritcally recycled ad nauseam by the neo liberal elites and their ever compliant press corp that currently hold America and Europe in thrall. In Europe a press that now daily condemns the continent's drift to neo fascism fails to bat an eyelid at its even more violent manifestation in Israel. Thank goodness for the likes of the international BDS movement and Electronic Intifada and their determination to speak truth to power. As long as there is a political discriminatory policy that lists only two categories: Jew vs. Non-Jew, racists will be on the rise. The identification of a "non-Jew" defines a person not by "who they are" but by "who they aren't." If you're a non-Jew, you are a negative. You could be a peacemaker or a terrorist, it really doesn't matter, because both would fall under the same category of someone who really "isn't." In most parts of the world, racism exists behind closed doors, but to make a political policy out of it and justify segregation and collective punishment... no wonder racism will increase. In Israel today, the new generation is encouraged to have such extreme racist ideas as they are backed by a government that encourages them to do so. And so racism is on the rise, not only targeting Arabs, but also the Sudanese, Ethiopians, Russians, and others. What does this remind me of? 1930's Germany. The victims have well and truly become the perpetrators.